Lucas Black wears black low cut Converse “Chuck Taylor” All Stars in the film. 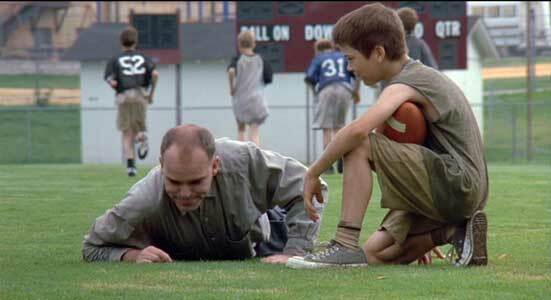 Young Frank Wheatly befriends Karl Childers in Sling Blade. Sling Blade is an interesting character study developed for the screen, written, directed, and performed by Billy Bob Thornton. The film is a remarkable tour-de-force by Thornton, who plays Karl Childers, a retarded man who has been in a mental hospital since he was nine years old, but was recently released, and sent back to the small southern Arkansas town where he grew up. Karl was institutionalized because he found his mother making love with another man and he killed them both with a sling blade. In a monologue, ostensibly to a reporter from a high school newspaper, but really a way to inform the audience about his background, we learn that the authorities feel that Karl has been cured, that he really isn’t a killer, wouldn’t kill again. As Karl puts it, “I reckon I got no reason to kill no one. Uh, huh.” We soon find out that although on the surface Karl seems to be a simple person, he has some complexity to his character, similar in some ways to the Forest Gump role made famous by Tom Hanks. Karl is observant of human behavior, and will often just sit or stand quietly watching people while compulsively kneading his hands together. He is a talented repairman, and can fix nearly any type of small engine. While some of his behavior is obviously the result of his many years of institutionalization, there is a certain presence to his character that come from logical thinking, even if it is at very simple level of comprehension. Although Karl has very limited experience in expressing emotions or feelings, it becomes clear that beneath his naive and unsophisticated demeanor he holds strong opinions about what is right and good in life and the backbone to stand up for what he believes in. 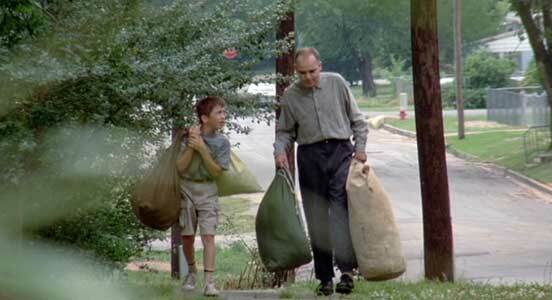 Karl helps Frank carry home the laundry from the laundromat, just after they first meet. The simple plot begins to unfold after Karl is released from the mental hospital and placed as a repairman in a garden equipment store by his supervising physician. Initially Karl lives in a back room at the store, where he is literally locked in at night, but after he begins to prove his reliability as a repairman, he is allowed more freedom. Karl meets a young boy, Frank Wheatly (Lucas Black) at a local laundromat and the two hit it off. Frank is desperate for any kind of friend, and Karl is grateful for anyone who is willing to accept him as a normal person. Frank introduces Karl to his widowed mother Linda (Natalie Canerday), and the two of them soon ask Karl to move into a spare room in their garage. Frank is happy to have Karl around, because he misses his father, and because he hopes that Karl will help protect him from Doyle Hargraves (Dwight Yoakam), his mother’s abusive boyfriend who makes it clear that he doesn’t like Frank. The other man in Linda’s life is her friend and boss, Vaughan Cunningham (John Ritter), who worries about Karl living with Frank and Linda, and decides to check him out. Vaughan is gay so his relationship with Linda is more like that of a brother, and he is generally ostracized by the rest of the town. Doyle is boorish and domineering, the kind of person who comes into someone else’s house and literally takes over. It’s hard to understand the attraction that Linda has for Doyle; when she is with him she seems more like an abused wife than his girlfriend, and her loyalty to him seems misplaced when the only real joy she seems to have in her life comes from Frank and Vaughan. One particularly revealing scene is when Doyle decides to get his band back together on a whim, and forces everyone to stay and listen. The band plays outdoors late into the night, upsetting the neighbors, and Doyle behaves in an insulting and condescending manner to band and audience members (Linda, Frank, and Vaughan) alike. It turns out the real reason he wanted to do this wasn’t to get ready for a performance, but just to exercise his power over others. As the scenes of the film slowly unfold, we learn tidbits about each character, and gradually we learn the sad story of Karl’s childhood. All this leads up to what seems to be an almost pre-ordained ending, but one that keeps you fascinated from start to finish. Karl, Frank, and Linda discuss Karl’s moving into their garage. 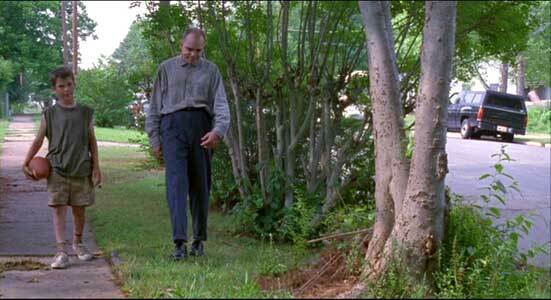 Part of the importance of Sling Blade is the statement that it makes about Billy Bob Thornton. In that sense it is like the first Rocky film by Sylvester Stallone, saying to the film world “Here is a new talent expressing a singular creative vision.” The characters are carefully drawn, and by the time the film is over, we have entered into the leisurely pace of a small, southern rural town. Thornton’s acting is outstanding as the story gradually reveals the underlying tragedy of Karl’s life, his road to personal redemption made possible through his friendship with Frank, and his confrontation with the demons of his past life. The consistency of his performance makes the ending of the film simultaneously horrifying and uplifting. This is because you remember scenes of simple pleasures like the one when Karl orders French fries for the first time as well scenes of despair like his meeting with his father (Robert Duval). Lucas Black’s performance as young Frank Wheatly is also excellent because he reminds you immediately of kids from another age. Open and friendly, unconcerned with trying to be hip, and yet vulnerable to the mean treatment he receives at the hands of Doyle, we see Frank as an ordinary kid who just wants to play football with the guys, and as a young man of the house with the courage to try and prevent Doyle from taking over his family unit. Country singer Dwight Yoakam plays the mean-spirited Doyle with real arrogance and menace, while John Ritter gives us a sensitive portrayal of a gay man trying to survive in the fish bowl of a disapproving small town society. Natalie Canerday is pleasant enough as Linda Wheatly, but it would have been interesting to delve a little more into her character, and look at the contradictions that on the one hand caused her to be a good mother to Frank, yet be attracted to Doyle at the same time. As the film progresses we get to understand something about Karl’s difficult life, and empathize with the decisions he ends up making. Karl passes the ball to Frank. Frank talks to Karl after the big play. Lucas Black in his role as Frank in Sling Blade wears low cut chucks throughout the film. Mostly they seem like they are dirty white, but in the few closeup scenes, they appear to actually be black, perhaps washed a time or two. 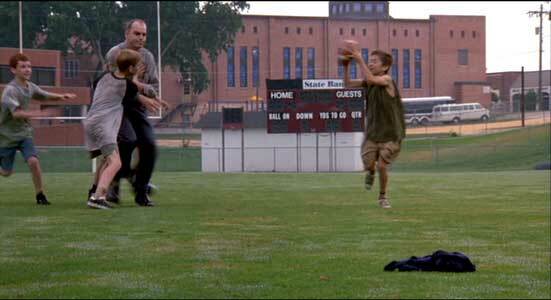 The best chucks scene in the film is the football game where Karl helps Frank to score a touchdown. Frank thanks Karl for passing him the ball and letting him score the touchdown. 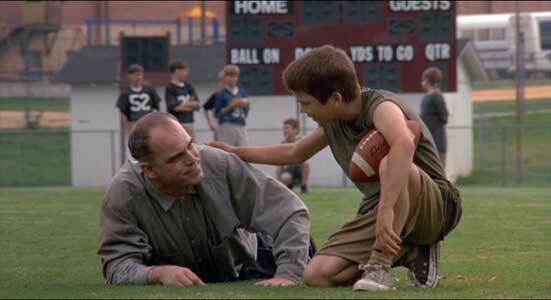 Sling Blade. (1996) Billy Bob Thornton, Dwight Yoakam, J.T. Walsh, John Ritter, Lucas Black, Robert Duvall, Natalie Canerday. Written and directed by Billy Bob Thornton. Categories: Drama, Crime and Mystery.